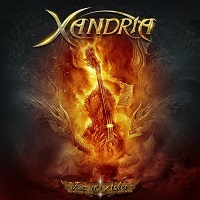 One of the world’s few Symphonic Metal bands to not come out of the Netherlands, yet still match their peers in excellence, German stalwarts XANDRIA has since taken on Dutch soprano singer Dianne Van Giersbergen, also of EX LIBRIS, taking over from Manuela Kraller in 2013. With a new album on the horizon, XANDRIA plan to release a new E.P. in the interim, titled “Fire & Ashes”. The new release contains brand new tracks, two remastered and rerecorded tracks and two covers, from two starkly different corners of rock; MEATLOAF and SONATA ARCTICA. Given the success and brilliance of the band’s previous album, “Sacrificium”, and Xandria in general, whom have a habit of releasing albums that are a consecutive improvement, it’s hard to imagine how much future material will be able to stand up, as happens with bands with such an extensive career. “Voyage of the Fallen”, one of the three brand new offerings, is already leaps and bounds ahead of the majority of songs on “Sacrificium”. Already famous for dropping the “guitars, violin, let’s call it a Symphonic band for shits and giggles” archetype that many hopeful bands that populate/overpopulate the genre are guilty of, “Fire & Ashes”’ first song takes a heavy and incisive Power Metal approach, where pristine and strong guitars are at the forefront of the instrumentation, providing a neat and intelligent balance between heavy riffs and blistering leads. What I have to love about Dianne’s vocals on this track, however, is how she manages to make ‘opera’ catchy, creating choruses that no mortal human could sing-a-long to, no matter how much they wanted to. Epic, up-beat and cinematic is how “Voyage of the Fallen” sets the stage for future XANDRIA material. The next track, “Unembraced”, in XANDRIA fashion, takes a different route, the majority of the riffs set in a driving mid tempo, with a much more pronounced dramatic flair with jarring chord progressions, equally as juxtaposed with the silky-smooth choruses that flow like icewater. Arguably more progressive than the previous track and ultimately unpredictable. “In Remembrance”, the final of the three, shows yet a different face of the band in a dew-slicked, slow-moving ballad that continues to osmose, the timbre growing as the song progresses and is ultimately a Dianne showcase; a smart move, considering how well-represented the guitars were in the previous tracks. The covers on this new E.P. are a curious case, because they both accomplish different things; one making me laugh, one blowing me away. The MEATLOAF cover, “I’d Do Anything For Love”, may sound like an epic and heavy Symphonic cover of a Classic Rock song, but I cannot shake the image of MEATLOAF singing with a glistening, feminine soprano voice. The choice of song was absolutely ingenious, and is one of my favourite XANDRIA moments in a long time. “Don’t Say A Word”, one of Finnish titans SONATA ARCTICA’s more well-known tracks, was covered and even more Power-Metal-ified than the original, with even louder guitars. In my experience, covers are either done to put an ingenious and/or humorous spin on the original, or end up painstakingly awful. XANDRIA, however, to me (disagree as you wish), have actually ended up making a cover that comes across superior; Metal was never meant to be a competition, yet I can’t help but finding myself enjoying this effort immensely; a feeling I didn’t experience with the original. While I can confidently expect this E.P. to shed some light on the next XANDRIA album, I think it’s safe to say that XANDRIA are, once again, moving onwards and upwards.